The Brookhaven, Georgia area, in the northeast suburbs of Atlanta, experience several types of weather that can be detrimental to the health of your foundation. The constantly varying temperatures in the city and the occasional severe weather can spell trouble for concrete foundations. Too much or not enough moisture in the soil around your foundation can cause erosion or soil shrinkage, creating voids that lead to foundation settlement and sinking. Excess water and shifting temperatures can also cause the soil to expand, contract, or settle, opening the door for many different types of foundation failure. Fortunately, the Expert foundation repair team at Atlas Piers of Atlanta can help with all of your foundation repair needs in Brookhaven, GA. If you find any of these issues in your home, contact a repair expert as soon as possible to find the right solution and return your foundation to normal. We offer a variety of foundation repair solutions to take care of whatever problem you have in your home. Steel push pier or helical pier installation is used to support sinking and settling foundations. These piers are driven or screwed into the ground to lift and stabilize the settling foundations. Pressure grouting, a method by which cement based grout is injected beneath the slab to fill spaces and provide lift, can also be used to restore sinking foundations. These underpinning solutions are just a few of the foundation repair services that we offer. If the walls in your basement have started to lean, bow, or crack, it is important to have them repaired as soon as possible. 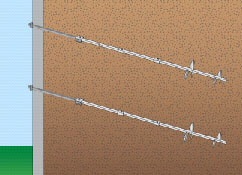 Helical tiebacks can be used to anchor into the adjacent soil and pull the walls back into place. Carbon fiber strips are another repair option that is particularly environmentally friendly. These strips are applied to the wall to stabilize, straighten, and close wall cracks. 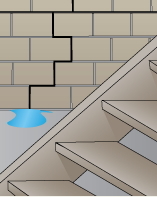 This helps keep the foundation supported and prevent basement water issues. We also offer encapsulation services to keep moisture out if your basement or crawlspace. This process involves installing a vapor barrier along the interior of the basement or crawlspace to seal out moisture. Other foundation repair services that we provide include: new construction piers, hardscaping, concrete repair, masonry repair, micro pull down piles, and more. For more information on our foundation repair solutions in Brookhaven, GA, contact us today.